The company is specialized in offering optimal quality Sodium Bromate that has several implications in industries. 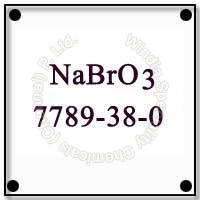 Sodium Bromate is also indicated as NaBrO3 in chemical language. The Sodium Bromate Powder made available by us, is processed from good quality raw materials. It naturally appears in odorless, white crystal from which is soluble in water and insoluble in alcohol. Sodium Bromate has fire hazard and thus it has to be handled carefully. Sodium Bromate Powder is commonly used as analytical reagent in various industrial and research application. Apart from this, we are counted as one of the prime NaBro3 Powder Manufacturers and Exporters from India. Description = White and Crystalline powder. These are packed in 25 kg HDPE woven sacks with inner lining and 50 kg HDPE drums.